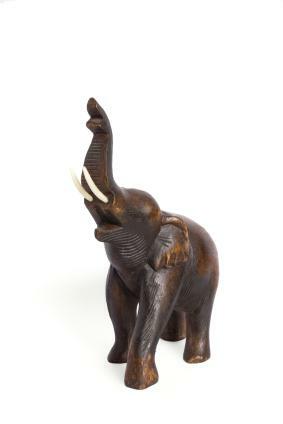 Collectible animal figurines range from majestic lions and stately elephants to whimsical pigs and adorable kittens. Whether you love jungle wildlife, a particular dog breed or miniature bears, collecting figurines of your favorite animal is a hobby that is fun for the whole family. For some collector's, the hardest decision is how to limit their animal figurine collection. Many decide to collect only one type of animal such as tigers, others collect all animals from a particular group such as any type of large wild cat. Then there are those that collect pet figurines. In addition to limiting collections by animal type, there are collectors that only look for tiny miniatures while others want figurines made from specific materials. Naturally, there are also collectors that will add any animal to their collection simply because they fall in love with it. There are almost as many possibilities of collecting animal figurines as there are collectors. Animal figurines are available in a variety of materials and sizes making them one of the most affordable collectibles on the market. Generally, the prices of animal figurines range from several dollars to several hundred dollars. Russian Crafts which offers a beautiful selection of blown glass animals. Hagen Renaker miniature bone china and porcelain animal figurines are highly detailed. A wide selection of miniature glass animals from Vyshyvanka Ulrainian Gifts includes many whimsical poses. When we think of animal figurines, images of small replicas of animals come to mind. The definition of figurine, according to dictionary.com, is a small ornamental figure or statuette. Yet there are websites and collectors that refer to large animal figures and statues as figurines. An example is the life size tiger cub which is part of the Sandicast Wildlife Life Size series at Animal World. The Internet has many websites that offer various types of animal figurines. EBay and TIAS are all excellent sources for finding vintage and antique animal figurines. Ross Simons features the Swarovski Crystal Paradise Animal Collection and the Swarovski Silver Crystal Animal Figurine Collection. Wild animal figurines are the specialty of The Jungle Shop. Finding those special treasures to add to your animal figurine collection is a wonderful and satisfying experience. It can be emotional if the figurine stirs old memories of a beloved pet or a special trip to a distant place. If you already are a collector, proudly display your collection. If you are new to the world of collectible animal figurines, enjoy the feeling as you find those special little animals waiting for you to take them home. .